Whiteoak’s Jacob Campbell putts at the Hillsboro Elks Golf Club when the Wildcats visited the Hillsboro Indians on August 13. Following a successful season for the Whiteoak Wildcats Golf team that saw them finish in fourth place at the Southern Hills Athletic Conference (SHAC) golf tournament to end the season, the boys from Mowrystown are equipped to make moves in league play this season. The Wildcats return seven players this season and all of them are juniors and seniors. Zach Harless, a junior for the Wildcats, was one of only three Highland County golfers in the SHAC to earn all-league honors at the SHAC Tournament a year ago as he carded a score of 180. Along with Harless Whiteoak will be looking to the five seniors on the roster to contribute in 2018. The seniors for the Wildcats are Ryan Roberts, Chase Butler, Tyler Large, Jacob Campbell and Evan Brill. Along with Harless and the five seniors Whiteoak will also be represented in 2018 by junior Clay Risner. Whiteoak head coach Wayne Ferguson enters his second season at the helm of the Wildcats golf team and will be expecting his players to improve from the 2017 season. The amount of upperclassman leadership for the 2018 Wildcats golf team will be a positive for a team that has hopes of competing in the upper echelon of the SHAC. While the Wildcats may be unable to climb all the way to the top of the standings, because of the long standing hurdle of the West Union Dragons and the program that Dragons head coach Carl Schneider has built, they have the talent to compete with anyone in the league. August 7 – The Wildcats opened their season with a trip to Buckeye Hills Country Club in Greenfield to take part in the Adam Sharp Memorial. Whiteoak also had the opportunity to face the other four Highland County schools in the event. August 14 – Whiteoak traveled to Hilltop Golf Course in Adams County to take on the Peebles Indians and North Adams Green Devils in a key SHAC matchup. August 23 – Teams from Eastern and North Adams will travel to White Oak Golf Course in Sardinia to take on the Wildcats on their home turf. This match will have implications for the league title. September 18 – The SHAC Golf Tournament day three will be held at the Wildcats home course White Oak Golf Course in Sardinia. Whiteoak can make up ground at home. The Wildcats have all the tools needed to compete with the top three in the SHAC and can be expected to improve on their fourth place finish in the SHAC tournament from a year ago. Expect the seniors on the squad along with Harless to push the limits of what their opponents think they are able to accomplish in the 2018 season. It is likely that the experience of the Wildcats and their overall talent level will enable to compete for a spot in the top two of the SHAC. 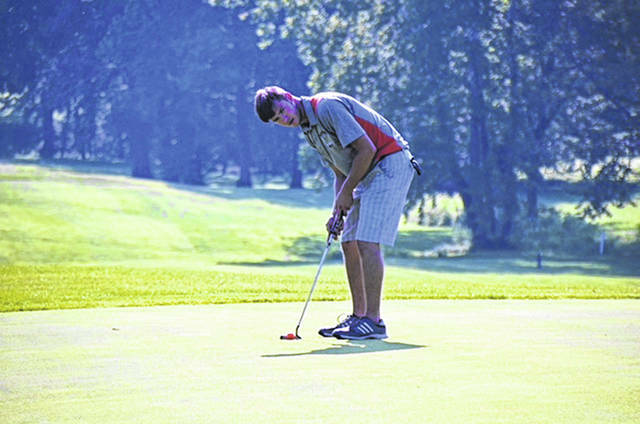 https://www.timesgazette.com/wp-content/uploads/sites/33/2018/08/web1_Whiteoak-Golf-Jacob-Campbell.jpgWhiteoak’s Jacob Campbell putts at the Hillsboro Elks Golf Club when the Wildcats visited the Hillsboro Indians on August 13.